Be careful about those chat-based conversations you’re having at work: In many cases, instant messages and Internet browsing habits are under the watchful eye of your bosses (or the IT guys). They want you working – and not gossiping with coworkers down the hall about how much you hate the dental policy. But if you just can’t help yourself, there’s Off The Record, a browser solution that can keep you in everyone’s good graces and still let you get your gossip on. Off The Record (O.T.R. for short) is a Snapchat-like clone, but for the work place. 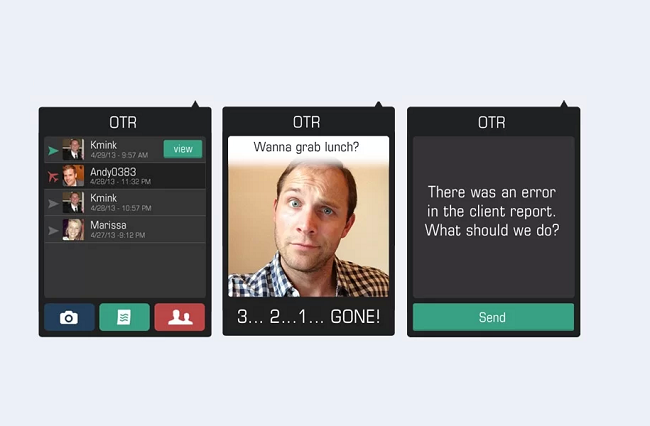 It’s yet another self-destructing messaging service, but this time there’s a time, place, and reason for using O.T.R. Unlike other ephemeral apps, O.T.R. is Web based. It’s a Chrome browser add-on only. The add-on was developed by Lamplighter Games – developers of the iPad game Trivia Party – last year at TechCrunch Disrupt. Like Snapchat, on O.T.R. you can view the message or picture for a limited time (five seconds to be exact) before the media gets deleted. And there’s no option to send videos yet. Since O.T.R. is meant for the workplace, it integrates with Yammer and allows you to send off-the-record messages to these contacts. Because O.T.R. is a browser plugin, your bosses won’t know that you’re using it, granted that they’re checking visited URLs and not actively monitoring your entire computer screen remotely (if that’s the case, you’re out of luck). But there are risks to using O.T.R. Knowing the innumerable security problems that Snapchat has faced (primarily, the ease with which you can screen capture something), self-destructing apps just aren’t the most secure platforms. But if it’s rather harmless gossip then there’s not much to worry about – just be sure you trust the recipient. Oh and also don’t forget to look over your shoulders. You never know who might be walking around your cubicle.